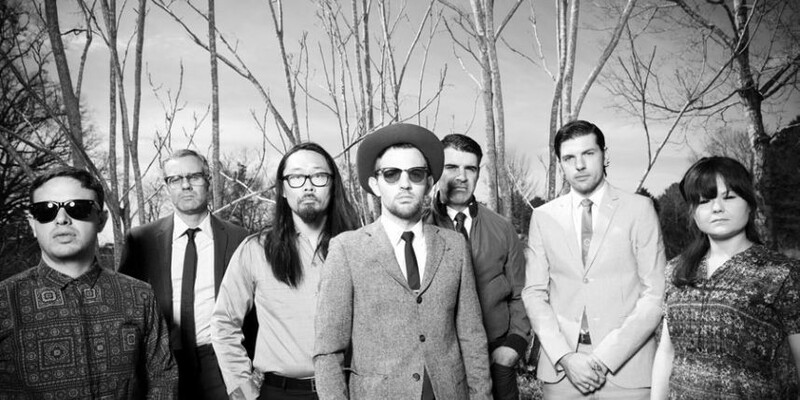 The seven-piece Avett Brothers band sounds like they've been making music together since birth. He's trying to explain to his family why this music effects him so greatly. "They talk about Brooklyn and heading north and road trips and love ... and these words mean so much more," he says, talking in the Northern Quest Resort and Casino foyer just after last night's Avett Brothers show lets out. And it's true, this young 20-something who wants his parents and siblings to understand what the Avett Brothers mean to him is going to have a challenging time when bringing up the band's lyrics. That song he's describing, "I and Love and You," repeats the title wording over and over. Many of their tunes implement "la la la's" and "ohhh's." It could come off as simplistic to some. Devout fans can have trouble defending their infatuation. But the Avetts' stage show is the place where it all makes sense. After 16 years together, they are tight, and loose, and emit a profound energy that draws people in. Last night, the seven-piece group rocked the Northern Quest outdoor concert space, keeping the audience, full of everyone from young 20-somethings to senior citizens, completely mesmerized for more than two hours. They arrived on stage playing "The D Bag Rag," a lively instrumental song off their 2003 album A Carolina Jubilee — always a favorite as Seth Avett gets to show off his mad kazoo skills. They kept on with the upbeat tunes, playing the spit-fire "Talk on Indolence" and also "Live and Die." Through this part of the set both brothers bounced and stomped around; they weren't afraid to look a little ridiculous. Now, when a band is touring behind a new album it's always reasonable to assume they'll play everything from it, forgetting many of the old tunes people have come to know them for. But last night, it wasn't until six songs in that the Avetts pulled out a fresh song from True Sadness. Their onstage version of "Satan Pulls the Strings" was scrubby and dirty. It sounded like they were splashing around in some moonshiner's bathtub. Some have worried that the new album, with it's more electronic leanings, wouldn't work on stage. But this live version far exceeded the record. Other new songs weren't as exciting and it could have been nice to hear some other fan favorites, but there's only so much time. For this tour the guys are looking clean. They got rid of the long hair and beards. They look like they've showered recently. And last night, the brothers were incredibly polite, saying they were so grateful everyone came out to see them. They didn't have much to say in-between songs, except when Scott Avett introduced his new tale of woe "Divorce Separation Blues." "Has anyone here been married?" he asked. As the sun set, the show continued to ignite the night, although stage effects here weren't too ambitious, just some playful lighting and smoke. Seth Avett's turn on the piano took "Head Full of Doubt" to soaring heights and the band's fiddle player Tania Elizabeth and cellist Joe Kwon absolutely slayed. The group kept following Seth's lead through the set, as he seemed to be deciding some songs (or at least versions of them) on the fly. The band's final "I and Love and You" had nearly everyone in the audience singing along. Walking out the guy behind me said to his woman: "That one song, they outdid themselves, it was amazing." It was as if Grace Potter opened up her backyard and invited us all over for booze and some laughs. The set, where she played both guitar and keyboards, just felt like a party where she and her friends decided to play music together that night. It seemed off-hand and in the moment. As always, she was superb. She should be far more famous than she is.